A man walks in the compound of a distribution hub of the Chinese logistics company Best Inc in Beijing, China. HONG KONG - Best Inc, a Chinese logistics company backed by Alibaba Group, slashed its proposed U.S. initial public offering after receiving tepid response from investors to its initial valuation, IFR reported on Tuesday, citing people close to the deal. The Hangzhou-based company now plans to raise up to $495 million with the sale of 45 million new American Depositary Shares (ADS) in an indicative range of $10-$11 each, added IFR, a Thomson Reuters publication. Best was set to price the IPO on Sept 19. The IPO previously consisted of 53.56 million new shares and 8.54 million existing shares from shareholders offered in a range of $13 to $15 each. Best didn’t immediately reply to a Reuters request for comment on the new IPO terms. 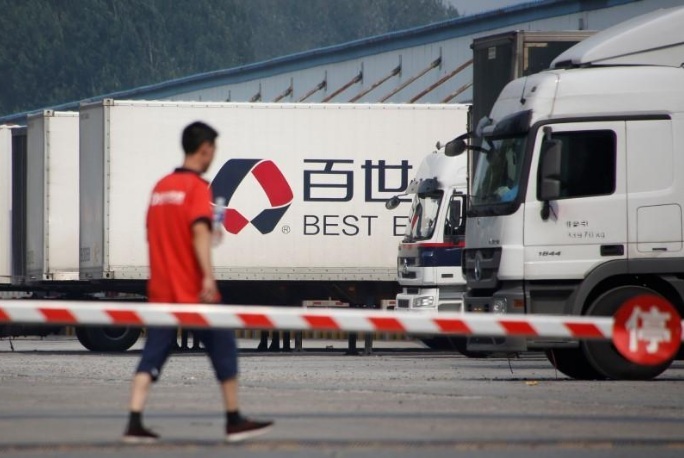 Best Inc, a Chinese logistics company backed by Alibaba Group, slashed its proposed U.S. initial public offering after receiving tepid response from investors to its initial valuation, IFR reported on Tuesday, citing people close to the deal.